Appearance of hotel as a whole was very pleasing and comforting. Cleanliness was very good but not the best ever seen. Beds are comfortable for short people but caused back pain for a tall person such as myself, which is uncommon to me. Back pain for several day following two nights stay at hotel. Easy access off and on I-10. Good workout room. Comfortable beds. Nice pool and whirlpool. EXCELLENT experience! Front desk didn't have change for a $5. This hotel is a great value, curtious staff, big clean rooms, great bathrooms and resturant with bar on site. This hotel has beautiful rooms and great beds. The smoke free Courtyard by Marriott Houston I-10 has made a commitment to be the best hotel on Houston's West Side guarantees you will find your stay both memorable and enjoyable. This Courtyard property offers five meeting rooms with over 2,600 square feet of space can accommodate gatherings up to 250 people, with plenty of parking for everyone. There are a lot of recreation opportunities nearby, including a biking trail, a bowling alley, horseback riding, a jogging and fitness trail, miniature golf, tennis courts, and volleyball courts. Golfers will enjoy being so close to the Bear Creek Golf Course, the Cinco Ranch Golf, Green Meadows Golf Club, and the Glenbrook Park Golf Club. Other local attractions and landmarks include Baseball USA, Katy Mills Mall, the Astrodome, the George R Brown Convention Center, the Houston Galleria, and Splash town. 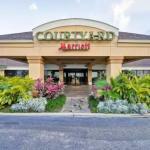 The Courtyard by Marriott Houston I-10 offers 170 rooms and 6 suites on 3 floors, and features rooms with air conditioning, alarm clocks, coffee makers and tea service, cribs for babies, electrical adapters, and individual climate control. Guests enjoy the Luxury bedding, which includes crisp linens, thick mattresses, custom comforters and fluffy down pillows, or hypo-allergenic foam. The Courtyard by Marriott Houston I-10 offers travelers a business center with large work desks, complimentary fax, copy machines, printers, and public computer with high-speed Internet access. Guests can relax and refresh in the outdoor swimming pool and hot tub and enjoy a work out in the well equipped fitness center. The Courtyard Cafe' serves American style breakfast, lunch and dinner 7 days a week, and there's also a Starbucks Java Cabana in the lobby. They also offer meeting rooms for business functions, parties, banquets or weddings. I would definitely recommend the Courtyard by Marriott Houston I-10. Online reviewers had plenty of good things to say about this location, they enjoyed that it was in an historic building. Guests also enjoyed being so close to Macy's, which has access to the tunnel system, which is a must apparently because Houston is subject to torrential rains and heat waves. Guests though they received an excellent value for their dollar and were extremely happy with the level of hospitality and service given by the staff. Guests appreciated the Starbucks, but weren't happy with Houston's lack of nightlife. One guest claimed that everything closed at 6:00 p.m.